I DO know loose-fitting workout clothes aren’t for everyone. The tops from Part 1 of this post are not ideal if you’re doing one-legged inverted staff in yoga — and your loose top ends up crumpled at your face, making it difficult to breathe, and then you pass out, and you cause a big scene, and it ends up being SUPER-embarrassing — all because of a fashion choice. And super-thick, loose-fitting sweatpants are definitely not ideal for spin class, where you could easily end up creating a huge pool of sweat under your bike, and they may end up calling maintenance to display a big yellow CAUTION sign next to your bike as a safety measure for other spinners, and once again, it would just end in a terribly embarrassing moment. Working out in regular weight sweatpants can be miserable for some. 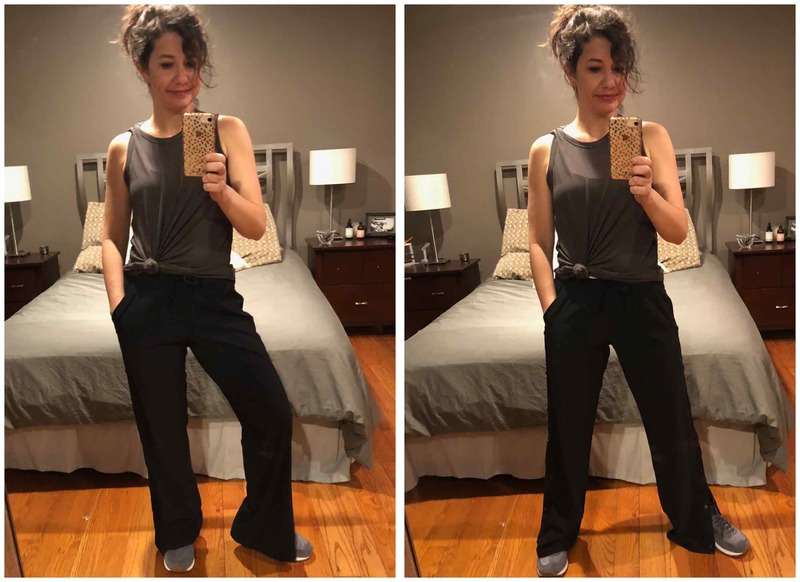 Here enters the “lightweight with drape” sweatpant solution. 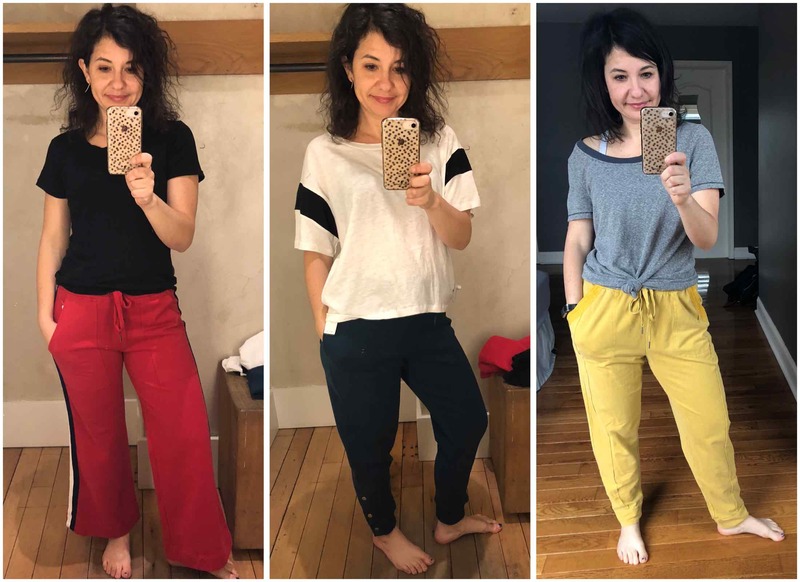 Drape in the fabric not only makes these pants pretty flattering (for sweatpants), but the material is also breathable and lightweight. When I workout in both of these below, I get no more hot and sweaty than I do in my leggings. The Gap joggers on the left are super-lightweight and have a lot of movement. I actually wore them to salsa night with my dance heels (so fun!) and a black tank, felt fairly stylish, and was still uber-comfy. The Athleta Barre Cinch pants on the right are my workhorses. Made from legging material, they are stretchy and awesome, and I love that they’re not skin tight. My experience with this Zella material and this Athleta material has also been good for not getting too overheated. These are your typical joggers. Fitted, heavier than the drapey ones, but still comfy and not skin tight. I really like both of the ones below. The Amazon joggers on the left were only $29 and fit well. They weren’t quite as soft or as quality feeling as the Zellas, but for $29, they’re pretty darn good. I get overheated easily, but I haven’t gotten overheated in these. Maybe because it’s winter and our dance studio is a little cold, but they have been fine for my typical workout. The Zellas are great. I love the zip pockets, they are super-soft, and they feel like they are made well and will last. You can see in the photo, I think they fit me just a tad better. I love this group of pants. Sometimes you just need a little bit of oomph when motivating to workout. These Free Peoples fit me a little snugger than I would like (for a sweatpant), but they’re comfortable and super-cute. They come with regular gold or rose gold side detailing as well. They’re not quite a regular sweatpant feel, but they’re definitely not “workout” material. If you do a super-sweaty workout, they might be better for a lounge pant instead…I would wear them to dance in, though, and be just fine. Alert: They’re 40% off right now!! I liked this sporty look more than I thought I would. 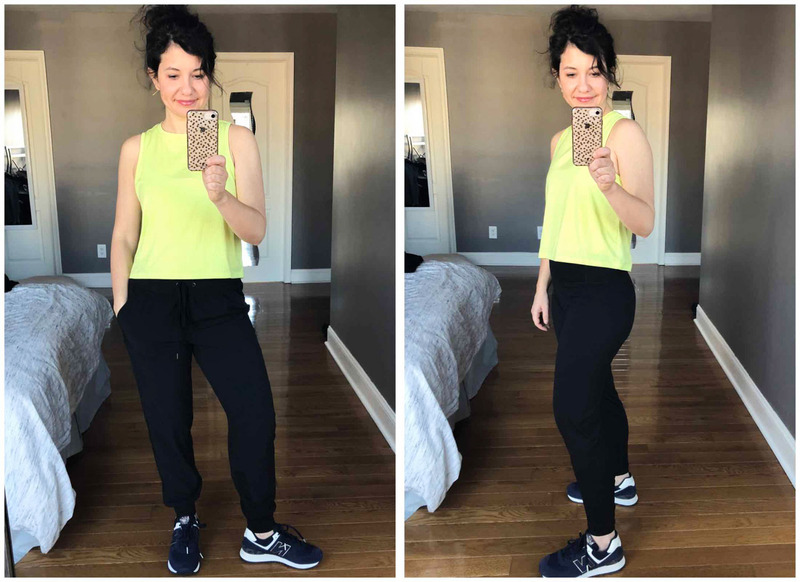 The pants are heavier than I would usually wear for an indoor workout, but they’re made from Athleta’s breathable and wicking signature fabric, so I would definitely wear them for outdoor workouts in addition to dance class in the winter, or as a cute top layered over leggings or bike shorts. 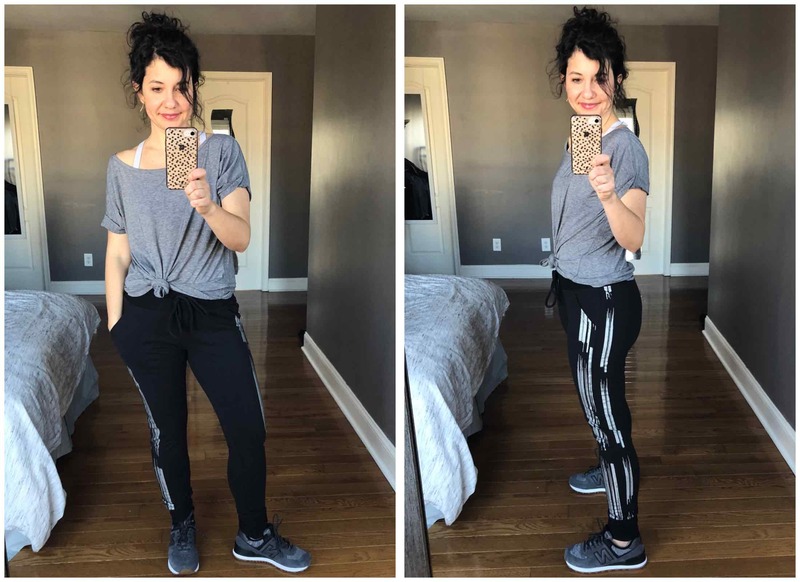 The Athleta snap pants below were too big and too long. I needed to size down and get the petite, but they felt AMAZING on. 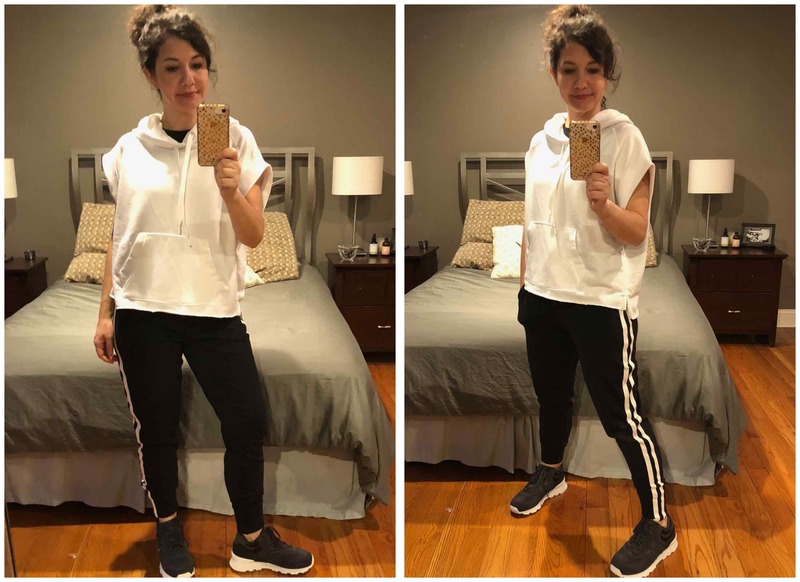 If you click through to see them on Athleta’s website, you can see they look pretty great when they fit well. I especially liked the lightweight material and the snaps that could be worn open or closed. Ahhhhh! How fun are these!!! I am super into Anthropologie and Free People’s workout lines right now. I have to be honest — I would probably wear the ones below more for lounging or “around town”, but I COULD wear them to dance class…especially in the winter. The ones I tried are from Anthropologie, but many of Free People’s are made with more breathable material for getting a little sweaty. Thank you so much to those of you who commented on Part 1. I hope I addressed most of your requests in Part 2. 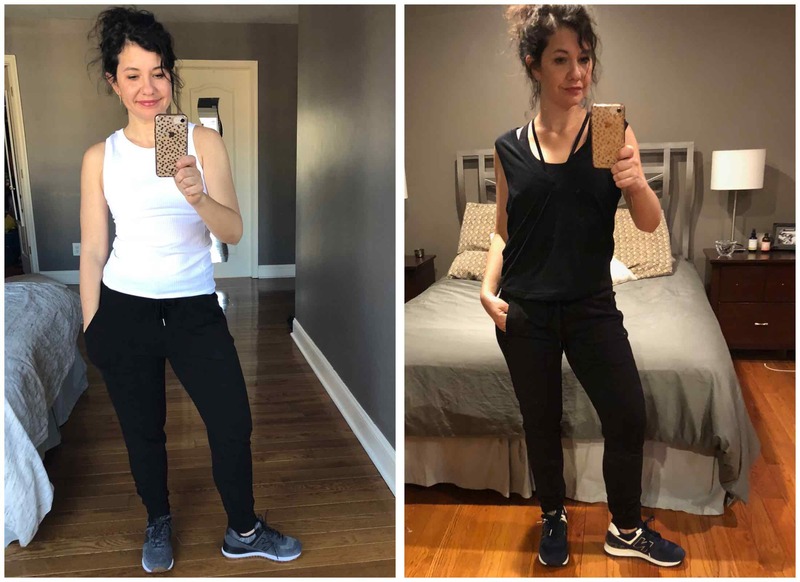 Anyone else on a skin-tight workout clothes hiatus? You’re so cute! I the GAP roll sleeve tee has been my favorite for years. I just got a second one recently. It is so flattering. I wear it untied with tight leggings (covers my booty) or tied with shorts or joggers. I have shorts from GAP too that are sooo comfortable and not too short. This is my favorite tank. I love the cotton blend and high neck. Thanks! I quickly bought the wide leg pair from Nordstrom Rack (first one in the ‘more’ under the trouser & flares section) Donna Karan brand. 2 thumbs up! Fits TTS and good length (I’m 5’9″ so that can be an issue.) They were to replace a Target pair I wore for too many years – I’m quite happy! Thanks, Linzi.